I’m doing something that I should have done a long time ago: collecting a series of posts into one single post. The links below show the mathematical magic show that I’ll perform from time to time. Part 2a, Part 2b, and Part 2c: The 1089 trick. Part 3a, Part 3b, and Part 3c: A geometric magic trick. Part 4a: Part 4b, Part 4c, and Part 4d: A trick using binary numbers. Part 5a, Part 5b, Part 5c, and Part 5d: A trick using the rule for checking if a number is a multiple of 9. Part 7: The Fitch-Cheney card trick, which is perhaps the slickest mathematical card trick ever devised. Part 8a, Part 8b, and Part 8c: A trick using Pascal’s triangle. Part 9: Mentally computing given if . Part 6: The Grand Finale. 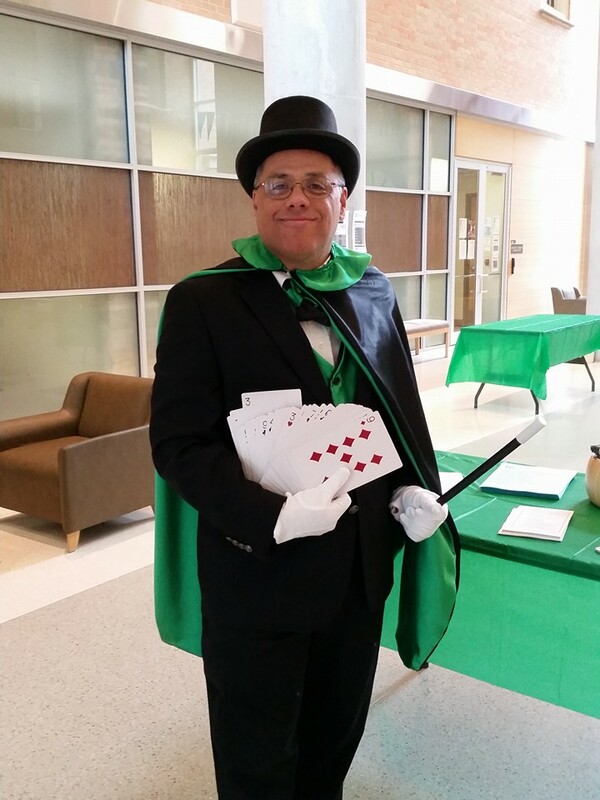 And, for the sake of completeness, here’s a recent picture of me just before I performed an abbreviated version of this show for UNT’s Preview Day for high school students thinking about enrolling at my university.